Beattie's Book Blog - unofficial homepage of the New Zealand book community: Random House launches New Zealand’s first ever Book App and website dedicated to crime and thriller lovers. Random House launches New Zealand’s first ever Book App and website dedicated to crime and thriller lovers. This weekend sees the launch of New Zealand’s first ever dedicated crime and thriller book app and accompanying website helping to address the needs and interests of avid crime and thriller fans around the nation. In 2013 Random House commissioned a survey which gained insights into the motivations of fans of crime and thriller books. Some of the key findings were that readers were extremely passionate about the genre, and delight in finding others with similar tastes. They also discovered that recommendation is fundamental to discovery and sharing; readers rely on word-of-mouth to unearth new authors and books. In response to this, Random House Australia & New Zealand designed new digital tools to help readers connect with their favourite authors, discover new ones and, through a dedicated Facebook page, interact with each other. Featuring an array of content from authors, booksellers, publishers and more, these tools showcase the very best of crime and thriller books from around the world as well as local authors such as Ben Atkins the author of Drowning City whose book will be featured on the Crime & Thriller Books App launching this weekend. The free Crime & Thriller Books App will feature six page-turning local and international crime & thriller titles each month, with the first 10% of the book available to read. Readers can explore new authors, try prize winning authors that may have sparked their interest or review a book before recommending it to their book group. A select number of books will also have audio functionality so that people can hear the selection read aloud. - Brett Osmond, Director of Marketing and Publicity, Random House ANZ. 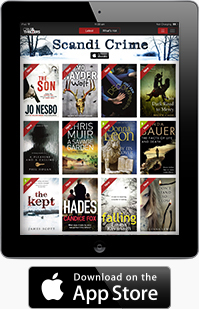 From the atmospheric, chilly fields of Scandinavian crime to the flawed hardboiled detectives; the horrors of true crime to the technicality of police procedurals; the distinctive style of Japanese crime to the pace of courtroom thrillers; the cross-country espionage to the gritty crime noir — the Crime & Thrillers app and website features big, brand name, authors such as Lee Child, Ruth Rendell, James Patterson, Kathy Reichs and Jo Nesbo, whilst highlighting lesser known authors, and championing debut authors in the field. The website also offers a specialised ‘Surprise Me’ function, where the reader is given recommendations based on genre they want to read. Combined, the app, website, newsletter and Facebook page provide a platform for readers to access early information about upcoming International author tours such as Karin Slaughters visit on the 11& 12 August, global news, read and watch exclusive interviews and videos, discover captivating books and incredible authors, and engage with like-minded readers.